This is a prime lens manufactured by Nikon and the model was launched 2007. The lens has a focal length of 400 mm. Depending on which camera the lens is used, the experienced and perceived focal length will be different. Please visit the list of compatible cameras below, it will provide the equivalent focal length you get on each camera. This aperture value indicates that the lens is very bright.This aperture value indicates that the lens is very bright. This will make it so much easier shooting in darker environments where you do not want or can use flash lighting, for example in churches or at different sports venues. Lenses with good aperture values and longer focal lengths, such as this lens, tend to be popular amongs sports and nature photographers. If you buy this lens it will come with a lens hood, whose model name is "HK-33". 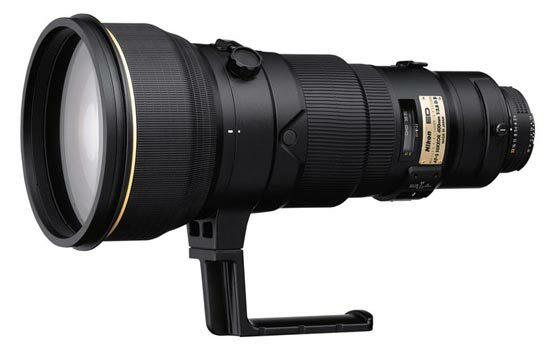 Text from Nikon: "Incredibly fast f/2.8 super telephoto combined with Nikon’s VR image stabilization and Nano Crystal Coat delivers exceptional speed and optical performance. Nikon´s Silent Wave Motor (SWM) enables ultra-high-speed autofocusing with exceptional accuracy and powerful, super-quiet operation. New A/M focus mode provides fast, secure switching between auto and manual focus operation."